I’m a fan of the Jason Bourne movies with Matt Damon. It’s the one movie franchise I get excited about. In a few weeks Universal will release the latest entry, which features the return of original star Matt Damon after a nine-year hiatus. Last week the outdoor marketing campaign hit Los Angeles with bus bench, billboard and building-draped versions. 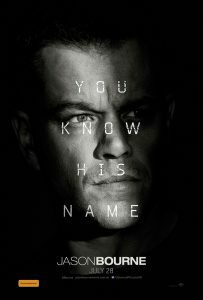 The key art is great, a moody black-and-white portrait of Damon (not hiding any wrinkles) as the coolly menacing Bourne. The tag line is “You Know His Name” and that’s all that needs to be said to make a powerful call to action to Bourne fans. So it’s puzzling why many of the ads also feature the movie’s eponymous title “Jason Bourne.” Was the Universal marketing team afraid we wouldn’t get it? I say less would be more. What do you think?